The volatility and polarity separator (VAPS) is an automated, field-portable instrument for real-time chemical characterization of OA that combines the organic mass quantification capability of AMS with the aditional separation capability provided by TAG. The VAPS system utilizes an initial thermal desorption step coupled to a focusing trap to separate discrete volatility bins (to provide polarity separation). Effluents from the re-desorption of individual volatility bins are send through a polar chromatography column (to provide polarity separation) and finally detected using time-of-flight mass spectrometry. All VAPS components are coated to passivate surfaces and transfer lines are kept at a minimum length to maximize mass transfer. The VAPS system is currently under development. 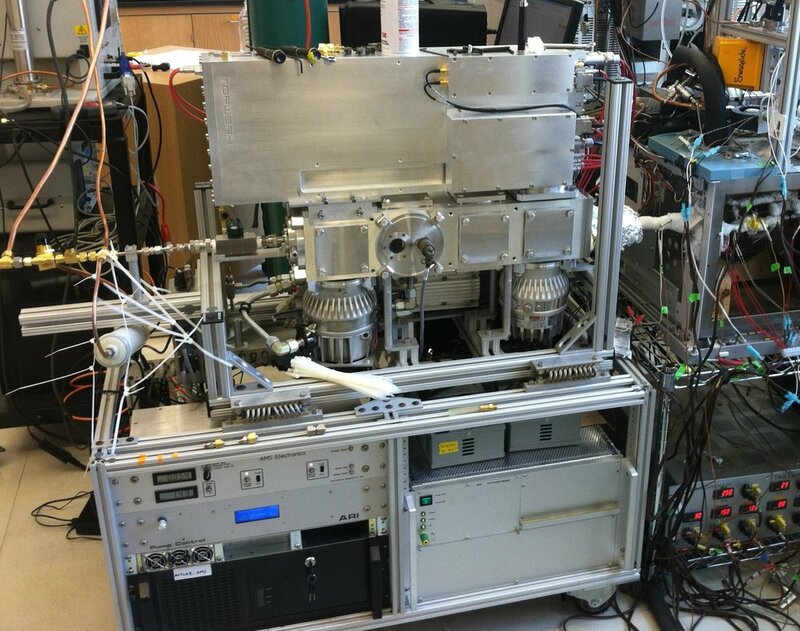 The thermal desorption aerosol gas chromatograph (TAG) system is a fully automated in-situ instrument capable of hourly speciation and quantification of ambient semi-volatile and non-volatile organic compounds [Williams et al., 2006]. Atmospheric particles are collected by huidification and inertial impaction. The sample is then thermally desorbed onto a GC column for compound separation with subsequent detection by quadropole mass spectrometry. The TAG system has been used to determine the major sources of organic aerosol in a variety of environments including remote [Williams et al., 2007], urban [Williams et al., 2010a], and forested [Worton et al., 2009]. TAG measurements have been used to apportion black carbon sources in an urban setting [Lambe et al., 2009]. Additionally, ambient phase-transitioning of semi-volatile organic compounds has been estimated from TAG measurements [Williams et al., 2010b]. Finally, comprehensive two-dimensional (2D) gas chromatography and time-of-flight mass spectrometry (ToF-MS) has been added to the TAG collector to allow for greater molecular separation (i.e., greater than an order of magnitude more species separated) and increased sensitivity [Goldstein et al., 2008; Worton et al., In Prep]. 2D-TAG has recently been used in laboratory-based controlled chamber experiments [Issacman et al., 2011a]. Both 1D-TAG and 2D-TAG systems are currently in operation. The TAG system has undergone extensive quantification development [Kreisberg et al., 2009] and has been compared to traditional filter collection techniques [Lambe et al., 2010]. TAG calibration is performed through injection of known quantities of liquid standards. These standards are composed of a wide variety of organic compounds with varying polarity, volatility, and functionality. In addition to external standards applied at varying concentrations (to determine calibration curve [Kreisberg et al., 2009]), recent efforts to fully automate the calibration system [Issacman et al., 2011b] have made it possible to apply deuterated internal standards in each ambient sample to correct for possible matrix effects [ambe et al., 2010]. NOTE: The TAG system was originally developed by Allen Goldstein and Brent Williams at UC-Berkeley in collaboration with Susanne Hering and Nathan Kreisberg at Aerosol Dynamics Inc., in Berkeley, CA. The TAG system is now commercially available from Aerodyne Research Inc. in Billerica, MA. The AMS allows real-time, in-situ measurements of the size distributions and chemical composition of aerosol particles [Jayne et al., 2000]. The AMS operates by using an aerodynamic lens [Liu et al., 1995; Zhang et al., 2002] to sample submicron particles into vacuum where they are aerodynamically sized, thermally vaporized on a heated surface, and chemically analyzed via electron impact ionization time-of-flight mass spectrometry. The AMS provides size distributions of total particulate organics, sulfate, nitrate, ammonium, and chloride. The high mass resolution provided in our HR-ToF detector also allows the separation of each unit mass peak into separaate contributions for specific elemental compositions (i.e., C,H,O,N, and S content) based on small differences in mass defect [Aiken et al., 2007]. The AMS has been deployed in hundreds of field campaigns and laboratory studies [Jimenez et al., 2009; Ng et al., 2010]. Note: The AMS was developed by Aerodyne Research Inc. in Billerica, M.A. We have created the multi-channel Tandem Differential Mobility Analyzer(mc-TDMA) to measure multiple properties of atmospheric aerosols. The mc-TDMA has three fixed channels, each able to investigate a single aerosol property. These channels are: a Scanning Mobility Particle Sizer (SMPS) channel which allows us to establish the aerosol size distribution existing in the atmosphere, a Volatility channel which allows us to evaporate condensed organics present in the aerosol and establish vapor pressures and enthalpy of vaporization for those organics, and a Hygroscopicity channel which allows us to investigate the willingness of the aerosol to take up water and eventually nucleate clouds. A fourth auxiliary channel exists so that an additional experiment/piece of equipment can quickly be attached to the instrument to study special situations that can arise when deployed in the field. All of these aerosol variables play a role in cloud/smog formation in our atmosphere, which is very relevant to present day problems like the existing uncertainties in Global Climate Models. The flow-through PAM chamber is used to expose primary particles or VOCs to extreme levels of OH and O3 to promote heterogeneous or homogeneous oxidation, respectively. The chamber was designed by the William Brune group at Penn State [Kang et al., 2007]. The chamber has continued to undergo improvements [Kang et al., 2011; Lambe et al., 2011a,b]. In our laboratory, we use the PAM chamber downstream of the emissions and combustion chmber to mimic atmospheric aging of individual particle sources, and to determine secondary aerosol (i.e., from VOC oxidation) chemical composition and formation pathways specific to individual sources. Three Thermo Fisher gas monitors are used for detecting trace levels of ozone, nitrogen oxides, and sulfur dioxide. Specifically, the model 42i-TL NO-NO2-NOx Analyzer Trace Level monitor measures nitrogen oxides by chemiluminescence, a model 43i-TLE SO2 Analyzer Trace Level Enhanced that detects SO2 by pulsed fluorescence, and the model 49i Ozone Analyzer that utilizes UV photometric detection. An additional model 146i Dynamic Gas Calibrator is installed with these, allowing online calibration of the monitors. We have designed and constructed a chamber to house laboratory studies on a variety of high temperature and combustion related sources of gas/particle emissions to the atmosphere. The chamber consists of a primary burn chamber and a secondary mixing chamber (time-averaging) chamber. Gases and particles are sampled from the secondary mixing chamber to stabilize concentrations.